Usage-based pricing has rapidly become one of the most controversial topics in Internet policy. Both wired and wireless broadband providers are migrating from flat-rate pricing to a variety of consumption-based pricing models. Some consumer groups have viewed the change to usage-based pricing with skepticism, fearing it will usher in an era of higher prices, deteriorating service, and increasingly anticompetitive conduct. This article evaluates the merits of data caps, tiered-service plans, and other usage-based pricing strategies. It finds that usage-based broadband pricing is not inherently anti-consumer or anti-competitive. Rather, it reflects a cluster of pricing strategies through which a broadband company might recover its costs and fund future investment. Under a flat-rate plan, lighter users cross-subsidize heavier users. By aligning costs with broadband use, usage-based pricing shifts more network costs onto those who use the network the most. Critics claim that usage-based pricing is unfair, because the marginal costs of data transport are low, and therefore heavier users do not cost more than lighters. But this argument ignores the significant fixed costs of building and maintaining a network. The central challenge for broadband pricing is allocating those fixed costs across the customer base. Unlimited flat-rate pricing is one strategy, but not necessarily the most efficient. 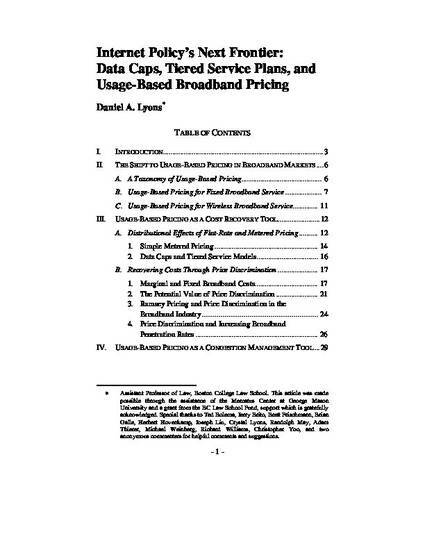 Usage-based pricing is a form of price discrimination that allows broadband providers to recover more of their fixed costs from customers with relatively inelastic demand. This strategy more closely approximates Ramsey pricing and therefore may be a more efficient way of recovering fixed costs without distorting consumer preferences. Pricing experimentation may also help narrow the digital divide. By recovering more fixed costs from heavier users, firms may have more freedom to extend service at a lower rate to light users who are unable or unwilling to pay the unlimited flat rate. There is evidence that these opportunities are beginning to emerge from companies engaged in usage-based pricing. Usage-based pricing may also help alleviate network congestion, though the case is less clear. Unlimited flat-rate pricing encourages overconsumption of network resources, which can create congestion during peak periods. Usage-based pricing encourages consumers to use less bandwidth and to demand more bandwidth-efficient practices by Internet content and service providers. But it is not clear that current pricing strategies will help mitigate peak-time congestion. To use pricing to shift consumption to off-peak periods, companies would need to show peak times are predictable. Fixed networks show regular peak times, but congestion is not currently a significant problem for fixed providers. On the wireless side, congestion is problematic but peak times are less predictable. With current technology, usage-based pricing may reduce aggregate demand and help chronically over-congested networks, but firms likely cannot yet use differentiated pricing to reduce peak-time congestion levels. Unquestionably, some vertically-integrated broadband providers may use usage-based pricing anticompetitively to shield cable affiliates from Internet-based video competition. While these risks exist, the literature suggests that vertical restraints on trade can be pro-competitive or anticompetitive. Regulators should remain vigilant with regard to potentially anticompetitive conduct, but should intervene only when a firm exploits market power in a way that causes actual consumer harm. Regulators should also assure that broadband providers have transparent pricing practices and give consumers tools to estimate monthly data use. Only through experimentation and empirical measurement will providers find the optimal pricing solution — which, by network, may vary dramatically. Thus far, regulators have correctly rejected the call to interfere with this pricing flexibility, absent a demonstration of market failure and consumer harm. This study shows why they would be wise to continue doing so. A working paper version was published by the Mercatus Center in October 2012.